The 72nd session of the United Nations (UN) General Assembly will open at the UN headquarters in New York on September 12 and the General Debate will kick off on September 19. Foreign Minister Wang Yi will head a delegation to attend the General Debate, during which he will give a full account of China's stances and propositions on the current international landscape and major international and regional issues and demonstrate China's firm resolve to stand ready to work with the other UN member states to uphold world peace and stability and promote development and prosperity. Prior to attending the General Debate, at the invitation of Minister of Foreign Affairs Manuel González Sanz of Costa Rica and Vice President and Minister of Foreign Affairs Isabel de Saint Malo de Alvarado of Panama, Foreign Minister Wang Yi will pay official visits to Costa Rica and Panama from September 14 to 17. 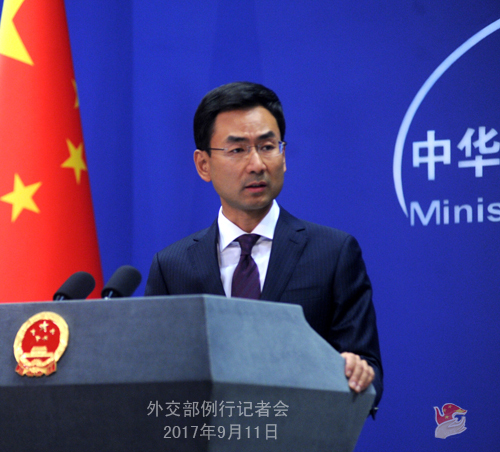 The Chinese side will exchange views with both countries on bilateral relations and issues of common interest. During his visit to Costa Rica, Foreign Minister Wang Yi will meet with President Luis Guillermo Solís Rivera and hold talks with Foreign Minister Manuel González Sanz. Over the past decade since the establishment of China-Costa Rica diplomatic ties, the bilateral relations have achieved rapid growth. The two countries have established the strategic partnership of equality, mutual trust and win-win cooperation, formulated the Joint Action Plan on China-Costa Rica Cooperation (2016-2020) and witnessed the steady deepening of exchanges and cooperation across the board. We are convinced that with the concerted efforts of the two sides, China-Costa Rica relations will continue flourishing and accomplishing greater new development. During his visit to Panama, Foreign Minister Wang Yi will meet with President Juan Carlos Varela and co-chair the first political consultation between the foreign ministries of the two countries with Vice President and Foreign Minister Isabel de Saint Malo de Alvarado. The two sides will hold the unveiling ceremony for the Chinese Embassy in Panama. Panama is an important country in Latin America and the friendship between the people of China and Panama dates back to a long time ago. In recent years, the relations between China and Latin American and Caribbean countries have witnessed great development and the exchanges and cooperation between China and Panama have also been on the increase. In June this year, the government of Panama, by accepting and pledging to adhere to the One China principle, severed the so-called "diplomatic relations" with Taiwan and established the diplomatic ties with the People's Republic of China. This is in compliance with the trend of the times and the aspirations of the people and opens a new historic chapter in China-Panama relations. The Chinese side stands ready to closely join hands with Panama to make the bilateral relations get off to a fast start and achieve steady and long-term development. Q: Just now you mentioned that Foreign Minister Wang Yi will head a delegation to attend the General Debate of the UN General Assembly. What role does China think that the UN should play under the current international landscape? How will China deepen its cooperation with the UN? A: As a founding member of the UN and a permanent member of the UN Security Council, China stays committed to the path of multilateralism, steadfastly upholds the international order with the UN at the core and supports the UN in playing a core and leading role in maintaining international and regional peace, promoting world development and improving global governance. China will continue taking an active part in the work of the UN in such areas as politics, security, development, human rights and arms control, promote democracy and rule of law in international relations and join hands with the other UN member states to build a new type of international relations with win-win cooperation at the core and foster a community of shared future for mankind. Q: The UN Security Council is due to vote on a draft resolution to impose new sanctions on the DPRK later today. What is China's position on this? A: The Chinese side approves that the UN Security Council makes further reaction and takes needed measures in response to the sixth nuclear test of the DPRK. We hope that the members of the UN Security Council can reach consensus on the basis of thorough consultations and utter the same and united voice to the outside world. The responses and measures of the UN Security Council should be conducive to realizing the denuclearization of the Korean Peninsula, upholding the peace and stability of the Peninsula and promoting the political settlement of relevant issues in a peaceful way. Q: It is reported that there is an inclusion in the relevant draft resolution which says that all parties should work to reduce tensions so as to reach a comprehensive settlement. Is this a result of China's efforts? A: If you read meticulously the previous DPRK-related resolutions adopted by the UN Security Council, you will see that the contents of these resolutions cover two aspects, one is to impose sanctions against the relevant steps of the DPRK and the other one is to call for the resumption of the Six-Party Talks at an early date so as to fundamentally resolve the Korean Peninsula issue in a peaceful and political manner. We hope that the response of the UN Security Council this time can also contribute to realizing the denuclearization of the Peninsula, upholding the peace and stability of the Peninsula and promoting the political settlement of the Korean Peninsula issue through dialogue and consultation. Q: According to reports, at the noon of September 8, Beijing time, a powerful 8.2-magnitude earthquake hit Mexico and has killed dozens of people. It is reported that this is the strongest earthquake that shook Mexico in the past century. What are the comments of China? Is there any Chinese citizen killed or injured in this earthquake? A: The Chinese side is concerned about the news that a massive earthquake struck Mexico and caused casualties. President Xi Jinping has sent message of condolences to President Enrique Pena Nieto on September 8. Foreign Minister Wang Yi has also sent message of condolences to Foreign Minister Luis Videgaray Caso. We deeply mourn for the victims and convey our sincere condolences to the people in the affected areas. 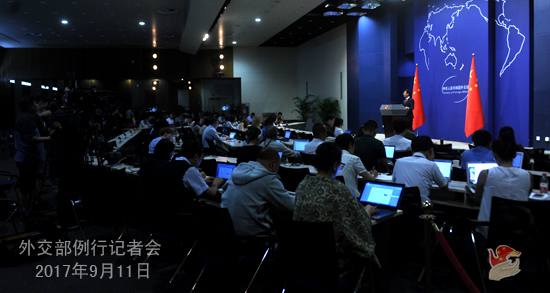 The Chinese government attaches great importance to the security of the Chinese citizens in Mexico. The Chinese Embassy in Mexico has immediately launched the emergent consular protection mechanism and to date we have received no report of the death or injury of Chinese citizens. 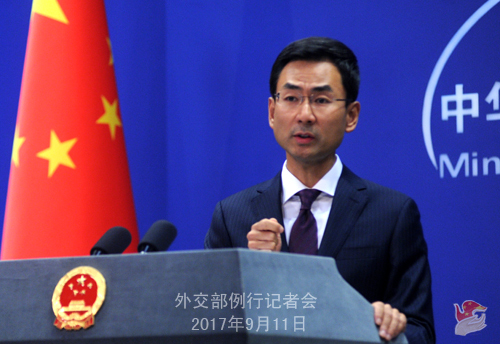 The Chinese Foreign Ministry and the Chinese Embassy in Mexico will continue closely following the developments of the disaster and provide needed assistance to the Chinese citizens in a timely manner. Q: There have been some reports that Chinese banks have placed fresh restrictions on the DPRK citizens and companies from operating in China. Can you confirm this and give us more details? A: The Chinese side has always implemented the DPRK-related resolutions of the UN Security Council in their entirety and fulfilled its international obligations. I am not aware of the detailed information mentioned by you just now. I would like to stress that China opposes the unilateral sanctions outside the framework of the UN Security Council, especially the so-called "long-arm jurisdiction" imposed by any other country on Chinese entities and citizens based on its own domestic law. China's position in this respect is clear-cut and consistent.